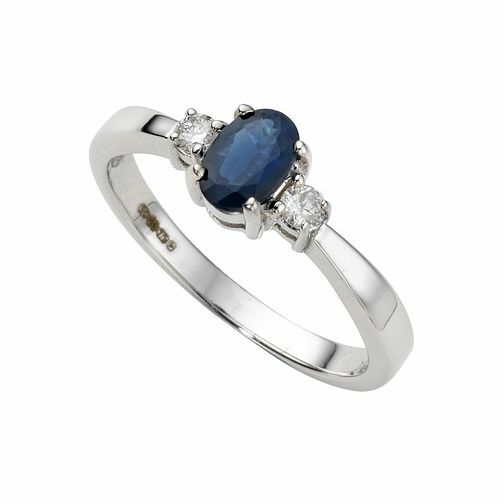 This stunning 9ct white gold ring features a deep blue sapphire accented with a diamond on either side. Sapphire is the birthstone for September so this makes the perfect gift for a woman born in that month. 9ct white gold sapphire and diamond ring is rated 3.4 out of 5 by 16. Rated 1 out of 5 by Anonymous from Poor Quality My husband and I chose this for my engagement ring back in 2013 and I've had to have it repaired multiple times since then (cracked through on one shoulder with a diamond falling out plus claws needing replacing/repairing). I have just been told by a repair place (another broken claw on saphire this time) that they will not touch it as the metal is weak, there are faults with it and that it needs to be rebuilt from scratch as there isn't really anything to salvage! Very poor quality for a ring that you want to be able to wear for the rest of your life!